She's Leah and she's ready for all the action with her favorite genie pals. 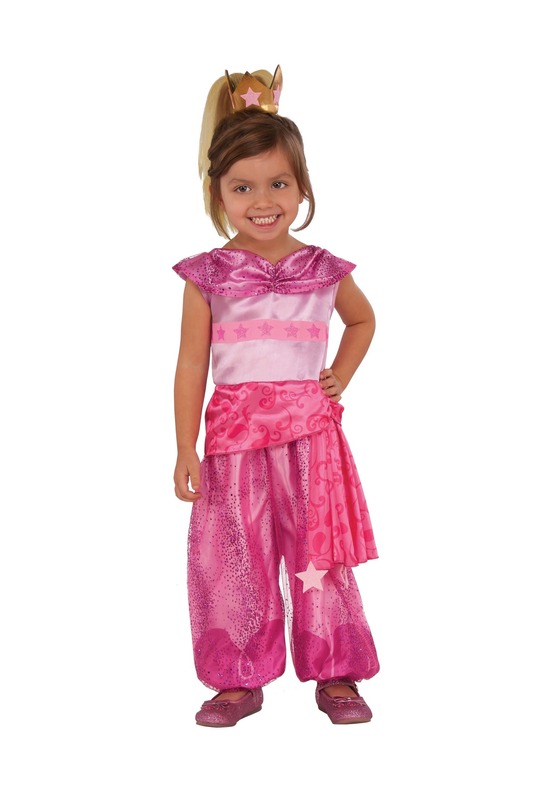 At least she will be when you outfit your girl with this signature Shimmer and Shine Leah costume. Then she'll be ready to be her favorite character. She is ready for a trip Zahramy falls, right? She sure will be when she has this kid's costume. Styled like the lead character from the hit Nickelodeon show, any little girl is going to adore this elegant style. And if you team her up with her friends or sisters as Shimmer and Shine, well, they're going to be ready to bring all the action from their favorite show to life! This kid's costume comes in size XS for toddlers, and S and M for young girls. With character details perfectly brought to life, this jumpsuit will be perfect for Halloween or for play time. The 100 percent polyester suit has a simple hook and loop strip closure, and the attached sash replicates Leah's character style. Tulle overlays feature glittery style, and stars stripe is just like Leah's gear! A crown headpiece accessory is also included to complete the look. She can use the included hair extension to get Leah's ponytail just right, or you can just style her own hair. When she has this costume, we're sure she's going to be ready for a real genie adventure!